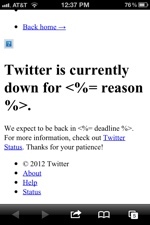 It appears we are not alone in our Twitter outage. Has someone or some govt interceded? Sad day for free speech. Japanese overload after winning soccer match at olympics. The same has happened before. “There is nothing wrong with your television set. Do not attempt to adjust the picture. We are controlling transmission. If we wish to make it louder, we will bring up the volume. If we wish to make it softer, we will tune it to a whisper.